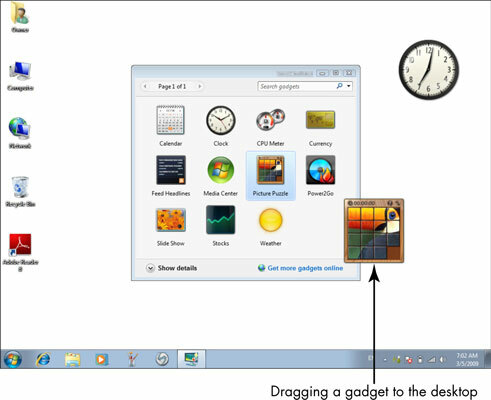 Gadgets are little applications (such as a clock or a calendar) you can display as icons on the Windows 7 desktop. Using Windows gadgets, you can quickly check the weather, review your calendar, check e-mail or the latest news, and more. Windows provides access to gadgets through its Desktop Gadget gallery. There are many gadgets you might want to add to your desktop to accomplish certain tasks. Display favorite images. Slide Show displays a continuous slide show of the photos in your Pictures folder. Organize your time. The Calendar gadget helps you keep track of upcoming days, weeks, and months. The Clock gadget displays the time using an old-style wall clock and allows you to make changes to your time zone. Play with a puzzle. The neat little Picture Puzzle gadget allows you to play a game that’s so tiny, even your boss or spouse won’t notice you’re not actually working. Review current news and other happenings. The Feed Headlines gadget allows you to grab data from online RSS feeds (a format used for syndication of news and other content), such as the latest headlines or other useful information. Stocks and Currency conversion gadgets provide up-to-the-minute data on stocks and currency values. Keep an eye on your system’s performance. The CPU Meter provides up-to-date information about your laptop’s processor speed and available memory.